Billy Idol has announced the first series of dates for a summer 2018 tour of the UK and Europe. Scheduled to begin in Manchester, UK on June 20, the Live! 2018 run mixes headline shows with some festival appearances, including Serbia’s Guitar Fest and Germany’s Tollwood. Prior to the European trek, Idol will perform at the Welcome To Rockville Festival in Jacksonville, FL on April 29, and the Carolina Rebellion in Concord, NC on May 6. 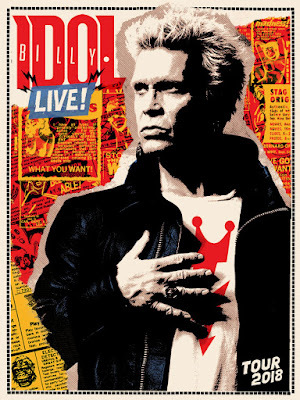 The rocker’s 2017 live schedule primarily centered around a pair of spring and fall residencies at the House Of Blues Las Vegas at the Mandalay Bay Resort and Casino; the “Billy Idol: Forever!” show saw the singer deliver tunes from throughout his career, including tracks from seminal British punk band Generation X and his solo hits.